Captain James T. Kirk, Mid-Season Edition! It is the stuff of legend among Star Trek fans that actor William Shatner, who played Captain James T. Kirk, found his appearence to be somewhat changable as the shooting season went on. In the begining of each season, Shatner, after a break during which he took every opportunity to work out, would be in tip-top physical condition, and ready to take on the galaxy. As the season wore on, the shooting schedule would take its toll on Shatner's time, and he'd begin to gain weight. By mid-season, this could become noticable, and Shatner's equator would become a cause for concern amongst the producers. The usual solution would be to take a few on-the-set still photos that emphasized Shatner's mid-section, and leave them in his dressing room. Shatner would see those pictures, and redouble his efforts to stay in shape. By season's end he would once again be the svelte Captain who made green galactic women swoon. 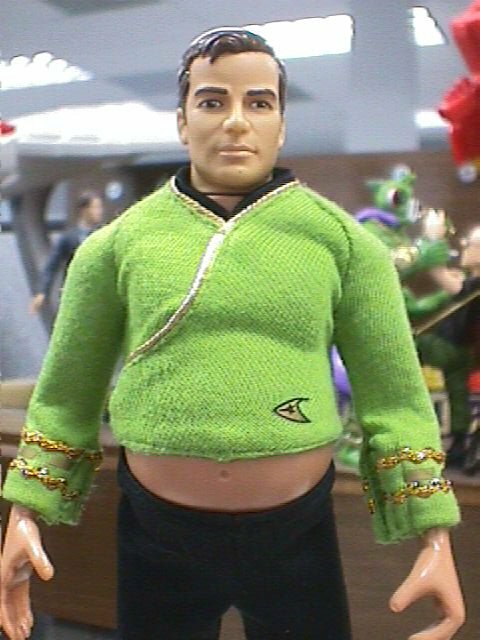 Playmates Toys now proudly introduces the mid-season Captain James T. Kirk action Figure. Beautifully sculpted in exquisite detail to capture all the subtleties of Shatner's classic, Shakespearean-trained acting style, this figure is sure to be a popular seller! The Mid-Season Captain James T. Kirk figure is fully posable, with nine points of articulation. Made with pride, in the People's Republic of China, by the imprisoned and enslaved survivors of Tienanman Square, This figure is a lovely collector's piece that will add to the decor of any true Trekker's room. Join us in celebrating one of the greatest TV series ever made, and the career of one of the finest actors Canada has ever produced. Join us in saluting the vision and the talent that have helped to carry forward the interest and delight of fans for over thirty years. Visit your local toy or hobby store, and pre-order your Mid-Season Captain James T. Kirk figure today! 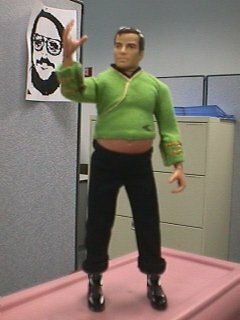 Mid-Season Captain James T. Kirk figure. This page is a parody. There is no such action figure other than the custom job I temporarily put together waiting to make a sculpt of my own head. 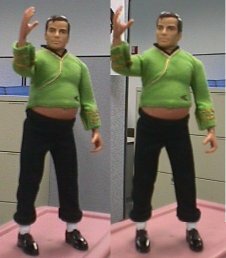 The figure is an Exclusive Premiere "Ralph Kramden" body with a Playmates 9" "Captain James T. Kirk" head.